Dominion is a two to four-player card game that plays in under an hour. In the mediaevally themed box you’ll simply find 500 (yes, 500) cards and a plastic insert that helps you keep all the different (about 40) types separate. Hey, come back! It’s not as scary as it sounds. 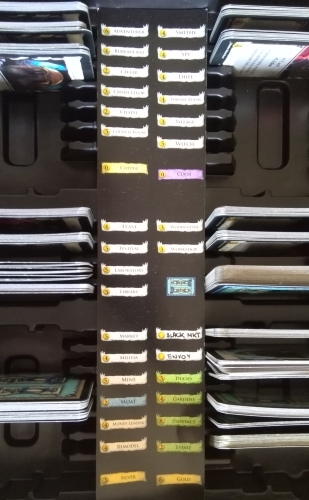 You wont use all the cards each game and set up, while fiddly at first, is straightforward. The cards are good quality and while the art is far from spectacular, the card layout and graphic design is. You can buy the base set for less than £30 and while the game has spawned many expansions, none are necessary. 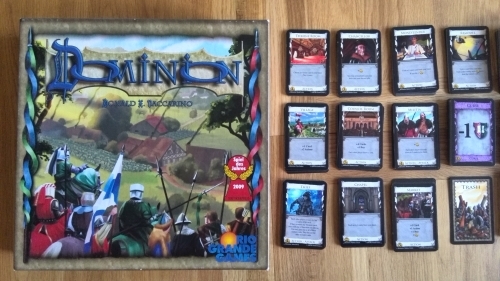 Released in 2008, Dominion was the first ‘deck builder’ – and the fact many games have since borrowed this mechanism pays testament to its importance. 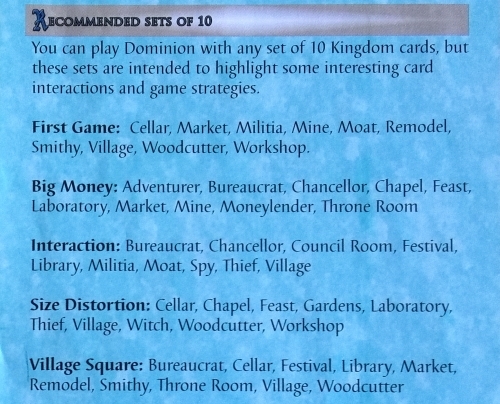 But more importantly, no other deck building game has yet aped Dominion’s considerable success. What designer Donald X Vaccarino did was borrow the key concept from hugely popular collectible card games (CCGs) such as Magic and Pokemon; letting players construct their own deck from a range of different cards. But while CCGs tend to reward the player who spends the most money on expensive ‘booster packs’, Dominion sees all the players constructing their decks from one shared and limited central source – and constructing this deck is the game, rather than being what you have to do before you even start playing. Everyone starts with an identical personal deck of 10 cards; seven worth one money and three worth an end-game victory point (VP). Players simply take it in turns to draw five cards from their deck and use them to buy better cards from those communally available; these are either more simple money or VP cards, or the more interesting ‘action’ cards. Of course the thing you want is those VP cards – but during the game these have no value (only at the end), so they simply clog up your hand when you draw them and slow you down. So the key is first building a great ‘engine’ out of cards to turn over a lot of money; and then changing gear to take VP cards at just the right moment. The basics of Dominion really are basic, while the cards (particularly in the base set) are mostly very simple to understand. Better still the game comes with two eight-page rule books; one explaining the rules, while the other walks you through the early turns and explains all the cards. 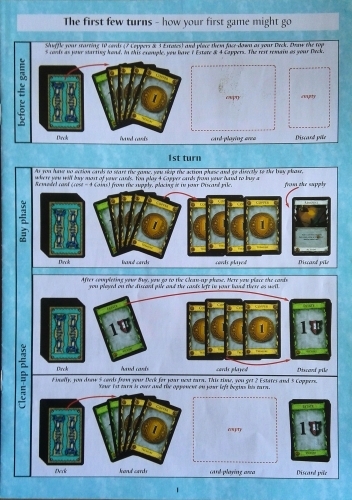 In addition the rules include some good examples of introductory card set choices. As mentioned above, the players will be buying cards from a communal pool in the centre of the table. These will always include three types of cash and VP cards, alongside 10 action cards. There are 25 different ones in the base set, meaning plenty of replayability. Most cards simply improve your options, but some are ‘attack’ cards which can play havoc with your opponents – doing anything from cursing them to stealing their cards. But you can introduce these at your own speed, or tailor the game to the type of players. With the game’s simple mechanisms explained, its simply a case of letting players experiment with the cards. Turns are taken clockwise and as all cards are used each turn there’s no harm in playing each round pretty openly, which really helps the process of picking up how the cards work. Better still, with simple games lasting just half an hour, you can very quickly get a few games in – while keeping the same set of cards out for a few games in a row really helps the set-up time between plays. The writer: When Dominion was released it brought something genuinely new to the party. And despite the game being a bit of a one-trick pony, that trick has proved good enough to see it stay in the Board Game Geek Top 20 for more than five years. While hardly oozing theme its elegance, variety and simplicity combine to make it a thinky yet family friendly game that plays quickly and cleanly. And with more than half a dozen large expansions available, there’s longevity in spades too. The thinker: What makes the game intriguing is first spotting the best available combinations, and then that tipping point from action engine to VP machine. However, once seen there’s no guarantee the luck of the draw will see you to victory – while seeing the winning formula is more fun than playing the game out to its conclusion. I don’t mind Dominion, but there are more engaging implementations of deck building that have since been built into more complex games. 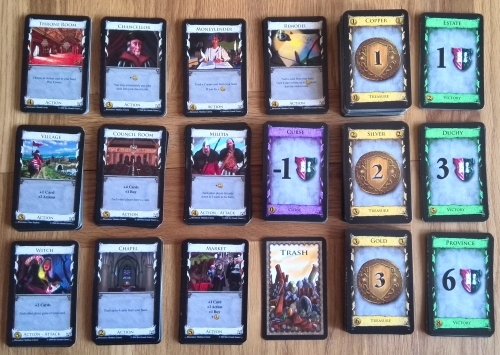 The trasher: Played as a ‘screw with your friends’ game, Dominion can be highly amusing – for a while. But the fact is that the action cards are a puzzle there’s no real need to solve; why not just buy money cards with your money cards and have done with it? Played in the right spirit (ie, nasty) and with the right people (ie, other thrashers) I’m always happy to have a round or two, but its not a favourite or a game I need in my collection any more. The dabbler: I’m always happy to play this and it’s a definite keeper! It can be a really social game, as you can help each other out on your turns – or equally mess with each other for fun. If you’re playing with more players and letting people take their goes, it can just be a chatty game too because you don’t really need to think much between your own turns. It’s also quick, so doesn’t outstay its welcome if it isn’t going down as well as you’d hoped. The word that comes up most often in criticism of Dominion is ‘boring’ – either in theme, gameplay or both. 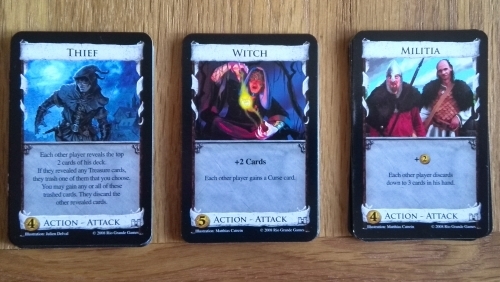 While the mediaeval theme isn’t exactly spectacular, it is functional and the cards make sense. And at its heart the game is very much a mechanism; any other theme would’ve been equally pasted on. As for the gameplay being boring it’s fair to say Dominion has gotten old for a lot of players, whether they liked it once or not. Its ranking is dropping of late and I won’t be surprised if this continues. There’s no getting around the fact that the game play is essentially repetitive and the combinations available are solvable. After 50 games I didn’t like it as much as I once had – but 50+ plays of a £30 game is good value in my books. And as I haven’t played it to death, I can revisit it like an old friend from time to time. It is going to very much depend on your group, but for the most part this game has proved a hit. Interestingly a Dominion clone called Thunderstone followed in 2009, borrowing its core mechanisms wholesale while adding an ill-conceived dungeon mechanic and an equally paste-on fantasy theme. It has taken a ton of work to make it play properly since (arguably its not much better than before), but for some these changes make all the difference. Horses for courses I guess. Then there are sci-fi deck-builders, horror deck builders, comic deck builders… A ‘bad’ game doesn’t spawn this many copycats – especially not when they’ve all failed (so far) to take its crown. In the end, there’s always going to be a certain amount of overly vitriolic hate for something that has proven so popular. Finally, an oft heard complaint is that its possible to pretty much break the game by ignoring the action cards and instead just buy money cards; upgrading them, repeating, then buying up the VP cards. You can argue, then, that the game is broken. But equally you can choose (as most people do) to ignore this fact and play the game as it was intended. If you can’t do this then no, the game is not for you. Dominion is one of the longest standing and most played games in my collection. I rated it an 8 back in 2010 and despite it getting a lot less plays over the last few years I won’t be changing that mark. It earned it and deserves it still. Where some see ‘boring’ theme and gameplay I see accessibility, which has seen it prove a hit with all the groups I’v played it with over the years – and that isn’t something you can say that often. While it may not have the glossy shine it had on release more than five years ago, you still won’t find another ‘deck builder’ higher than Dominion in the ratings. So if you want to try this style of game, its hard to argue a case for one of the alternatives unless theme really is a deciding factor for you or your group. For me its still the only pure game of its type on my shelf; but I can see a little piece of it in several of my current favourites including Concordia, Copycat and Rococo. And with that kind of legacy, I’d say it deserves at least a play or two of your time. This entry was posted in Board games, Games and tagged Board game review, boardgame review, card game review, deck builder, deck building, Dominion, Dominion review by Chris Marling. Bookmark the permalink.